If you are in any way representative of the typical Current Affairs reader, your eyes are probably getting ready to roll dramatically backwards at the sight of the words “genius” and “Rubin” in the same sentence. 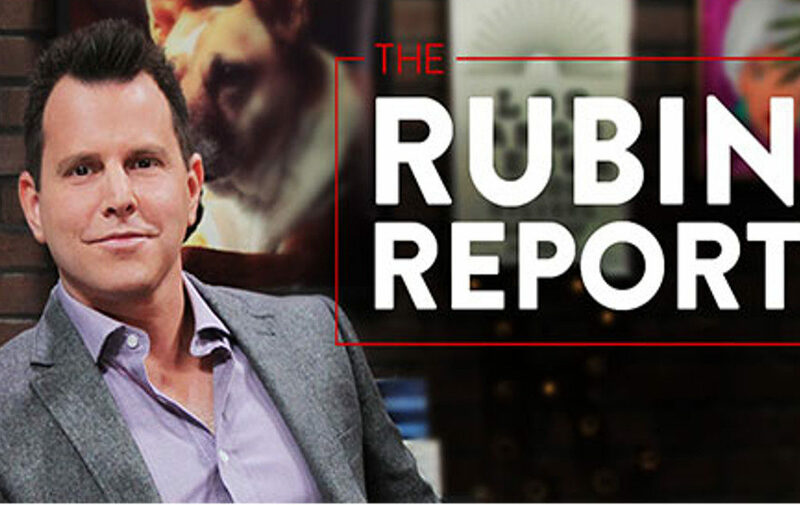 Certainly, Dave Rubin—host of popular Youtube channel the Rubin Report, and a key figure in the so-called “intellectual dark web”may not come across as a brilliant political mind. He’s made a few notable goofs, such as claiming Jesus was “around a lot of Muslims” despite living 600 years before Mohammed. He proudly labels himself a “classical liberal,” but when interviewed at length, he fails to clearly articulate any actual policy beliefs. He has struggled to defend his politics against such hardball interviewers as Joe Rogan, a man who usually absorbs the bad opinions of his guests like a bread roll soaking up soup. In general, he seems a sort of bland, bumbling figure, who somehow stumbled his way into an 800,000-subscriber Youtube channel. But look beyond the vacant eyes and the vague truisms. Rubin knows what he’s doing. And, judging by the state of the discourse, he’s doing it pretty well. 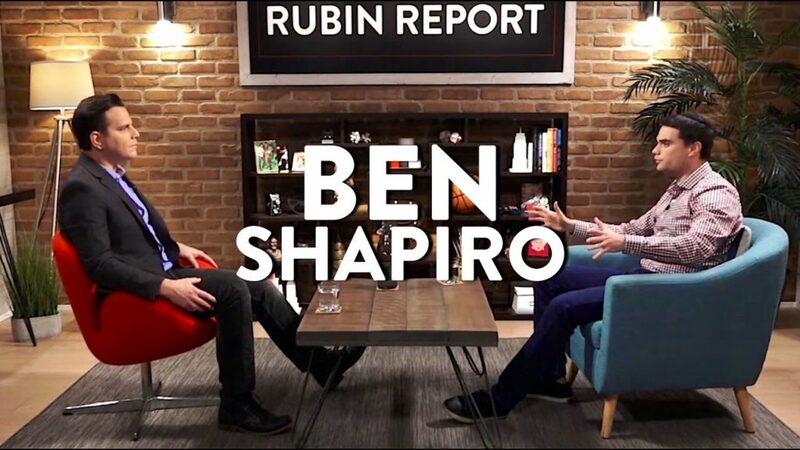 Rubin’s shows consist of interviews with various “intellectual figures”; usually an internet personality, pundit, or popular academic of some type, most likely conservative-learning, occasionally borderline-fascistic. Despite the guests having different areas of expertise (a word that applies to some guests better than others), the interview will usually hit upon the same talking points: the “regressive left,” free speech, the crushing weight of political correctness, and the world’s most important battleground, the Stalingrad of the 21st century—the college campus. Rubin is keen to bring these subjects up, no matter who the guest is, but tends to position himself as a neutral observer whose role is to listen, rather than a gadfly determined to poke holes in their views. To the casual observer, therefore, Rubin doesn’t appear too offensive. He does not frequently indulge in the same provocative language that a lot of his more alt-right leaning peers do (although he has spoken positively of the alt-right’s sense of humour). He has expressed an interest in improving the U.S. healthcare system. He is pro-LGBT and openly gay. His worst crime, at first glance, seems to be that he’s just a little bit banal. But beneath the surface of this mediocre series of interviews is a darker political project. Dave Rubin isn’t here to inform, or even to entertain. He’s here to shrink politics. Politics is a set of questions on the life and death of the nearly eight billion people living on Earth. So to make it small is really quite a task. It requires a dulling of the audience’s imagination, the crushing of radical ideas, the creation of a world where real concerns are shoved out of the picture while priority is given to the pettiest of grievances, all the while giving the impression that you are in fact presenting “the marketplace of ideas.” But Dave Rubin manages to pull it off. He is not always wrong or unreasonable on the subjects he does bring up, but the disturbing aspect of the show is just how narrow those subjects are, and how that narrowness convinces people that politics is about what happens at Berkeley rather than what happens in Washington, Silicon Valley, Standing Rock, Puerto Rico, and Yemen. You, too, could do this if you wanted to. The steps are simple. Let’s have a look at how an innocent-looking Youtube show can be used to turn political discourse stupid. Set up a well-lit studio with a couple of squishy chairs and a nice potted plant. One of your wealthy conservative donors will no doubt help you out with this—strange that conservatives are so keen to hand you money, since you are after all a liberal, but perhaps they’re just interested in making their competition as strong as possible! A cosy environment for your interviews will make your shows more marketable, make your interviewees more comfortable—despite apparently being victimised by the tyrannical leftist media, they are likely pretty wealthy and successful—and most importantly, it will remind your viewers that This Is What Politics Looks Like. Politics does not take place in the streets, or the workplace, or the prisons. Politics is what happens when two famous people sit in luxurious armchairs and blather. It is theoretical, not practical; it is the preserve of the comfortable, not the powerless. Remember to water the plant at least twice a week and keep it out of direct sunlight. In the past 12 months, there have been 63 guests on The Rubin Report (excluding a five-part series on former U.S. presidents and the occasional recording of a live show in front of an audience). The vast majority of these figures would pretty easily be described as conservative and/or libertarian, with perhaps a dozen being more aptly described as centrist/moderate, eclectic or apolitical. Perhaps two could be described as advocating for a liberal or left viewpoint. The first is Shon Hopwood, who advocates for criminal justice reform in ways that coincide with left viewpoints in some ways although not others (e.g., in favour of abolishing mandatory minimums, but also more law enforcement). The second is Mike Shellenberger, a Democrat and environmental activist, who is immediately directed towards criticizing Berkeley students and then toward the conservative-friendly topic of nuclear power and making California more welcoming to tech companies. This is called “balance” and is important for showing that you are fair. In the United States, the wealthiest and most powerful country in the world, almost four out of five full-time workers are living paycheck to paycheck. This subject is boring and not suited to the ambience of an important “ideas” show. Discussing poverty is a drag; it puts mundane imagery into the heads of the audience—a struggling single mother working two jobs, a family thrown into six-figure debt by illness—whereas a topic like “freedom” instantly puts one in mind of important imagery, such as flags and men in wigs. The closer you get to the abstract, and the further away from the material, the better, since any topic grounded in material concerns could steer dangerously close to critique of capitalism, a system your donors are rather fond of. If you’ve chosen what you like to focus on, remember that you can frame the topic in any way you like—and once you’ve framed the topic convincingly, it’s not always easy for your audience to remember that the topic exists outside the framing you are choosing to shed light on. Take, for example, free speech. To an enquiring mind, such a broad topic provokes a wealth of thoughts—at what point does a person’s speech constitute a danger to a person, or to society? Is this limited only to incitement to physical violence, or does it include dehumanisation, and other speech actions that cause medically recognised harm? 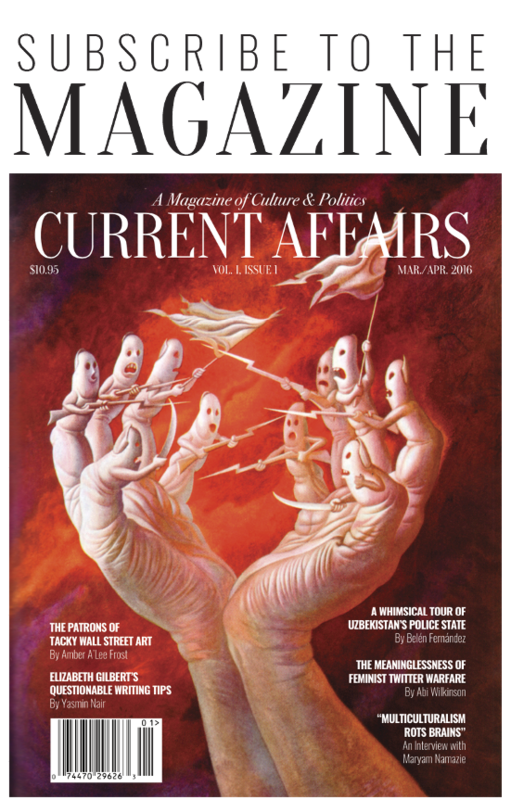 How do different societies understand free speech, and how does the U.S.’s approach compare to, for example, Germany’s idea of “fortified democracy”? Can one person’s free speech prevent another from speaking up? If some people are substantially more wealthy and influential than others, and can therefore create bigger platforms for their speech, is it really true that we all have the same right to free speech? Why is there an assumption that the U.S. has “free speech” when it is already denied to the most marginalised? Isn’t a key element of free speech the right to vote, which is subject to gerrymandering and suppression? What about unionising, which many workers feel afraid to do or even speak about? How does technology impact this issue? The blurring of lines between private and public spaces? Public safety? What stance should we take on the many restrictions of free speech imposed by individual states, such as anti-BDS laws or “no promo homo” laws? What happens when the President calls for media figures to be fired? What happens when someone who has come on your very pro-free speech show turns out to be not very pro-free speech when it comes to viewpoints they don’t like? These questions are awkward and sticky, with a long and complex intellectual history, and do not easily lend themselves to a simple answer that you and your audience can feel satisfied with. If you dig too deeply, you may even find that a lot of these questions are better answered by people on the left than on the right, which again might be a problem for the donors (though of course you are a liberal and the show isn’t taking sides here). A better approach might be to simply declare that free speech is good—something with which your guest will surely agree —and together you can send some jabs in the direction of your opponents, those dreaded leftists, who think free speech is bad. Of course, saying you’re in favour of “free speech” is a little like saying you’re in favour of “happiness” or “infrastructure”—it doesn’t really mean anything unless you clarify exactly what you think constitutes free speech, and how it can be achieved, and why the criticisms of your position is incorrect, and why this will result in the best society—but if you have a Very Intellectual guest who is inclined to agree with you, this may reassure your audience, and you’ll be onto another point before those questions can arise. What I wish, out of the Democrats, is that the old school Democrats still existed. What I’ve seen consistently is that as the progressives have gone further left—and I would say it’s really out there now—they’ve sort of taken the whole party and any of the moderate, sort of the blue dogs, or whatever you want to call that wing, I don’t know—they’re either silent or they’re gone altogether. Do you think that’s a fair estimation, or how would you even define some of these things like a blue dog Democrat, versus progressive…? Since your interviewees will generally be interested in the same sliver of the discourse as you—see Step #2—they shouldn’t need too much encouragement. You can most likely give them a prompt about the “regressive left” and let them run with it. However, you are bound to have the occasional errant guest who misses the point of the show, and may at times come dangerously close to making a point favourable to the left. Make it a point to guide these poor fools to the correct conclusion, by, for example, picking out one point from their long and detailed criticism of austerity and using this to claim they are in favour of right-wing economic policy. Try not to get frustrated with them; they are only trying to help. Remember, this is a show that loves ideas. Hence the phrase “marketplace of ideas”—people bring their basket of ideas, all the citizens come to look at the ideas, the good ideas get taken home, the bad ideas are left to rot. You can’t be accused of bias, or propaganda, if all you’re doing is showing ideas, and allowing your viewers to draw their own conclusions, surely? Of course, this metaphor makes quite a few assumptions. 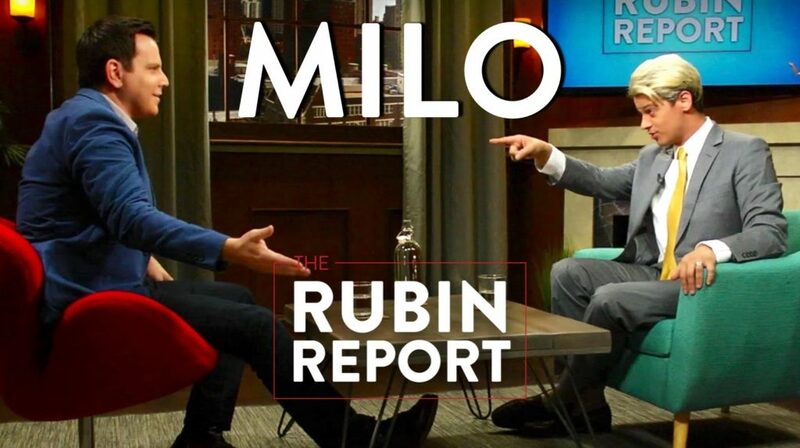 First, if the Rubin Report is a marketplace of ideas, it’s a rather shoddy one; one in which a handful of sellers try to lure you to their stall with promises of the newest, juiciest, most exotic fruits—such as you’ve never tried before!—but on closer inspection, all they have to offer you is the same bruised apples. Outrage about P.C. culture and overly liberal college campuses is nothing new; they’ve been conservative staples for decades. Even William F. Buckley, the oleaginous godfather of 20th-century American conservatism, wrote a book complaining about lefty college professors all the way back in 1951. Third, presenting a carefully curated selection of guests as the people who are selling “ideas” may lead the audience, perhaps without thinking, into concluding that these are indeed the only people with “ideas.” But ask yourself—are these really the only ideas that are out there? Where are the border abolitionists? The labor organizers? The health justice activists? These are people with ideas too—perhaps not ideas that Rubin is fond of, but radical, exciting ideas with a long intellectual and practical history, supported by many smart and interesting people who are far more unheard than the Petersons and Shapiros of this world, who deserve more than to be dismissed without a second glance as “crazy leftists”—worse, being dismissed without many of Rubin’s audience even being aware that such people exist. If the Rubin Report were being sold as a conservative show—a sort of Fox News for the Youtube generation—that would be one thing. But by presenting tired ideas as new and intellectually stimulating, by presenting conservatism as counter-culture, as “common sense,” as “classical liberalism,” as “new ideas,” in other words as anything but what it is, Dave Rubin shrinks your field of vision. Within the walls of his studio, the conservative world becomes the only world. All the people worth listening to are inside; the baying hordes of feminist beasts and antifa thugs lie outside. Yet this little world that’s been constructed on Rubin’s channel is small and petty. Politics is about all of our fates—how wealth is distributed, what our jobs look like, what our homes look like, what our cities and our environment look like, our safety, our health, our disposability, our dignity—but politics as it exists in Dave Rubin’s studio feels like little more than the gripes of a comfortable minority, frustrated by mean Twitter users and pronouns they find hard to remember. No matter how much these complaints might be dressed in the language of spiritual danger, it is difficult to see how they compare to the actual, real danger of climate change, of GoFundMes for cancer treatment, of police brutality, of genocidal foreign policy. The world is full of threats that need moral and practical answers. We need to think big. Unfortunately, if the success of the Rubin Report is anything to go by, it looks like the money these days is in thinking small.